Typically I make a point to miss the opener at shows, but I would’ve been sorry to miss Overcoats. The New York-based duo, Hana Elion and JJ Mitchell, emerged straight from the 70’s in flowy white blouses and corduroy blazers, their aesthetic reminiscent of Heart’s Anne and Nancy Wilson. Their music runs in the vein of indie electro pop, full of pulsing digital beats and synchronized harmonies. The set was composed of songs from their debut album Young, a work that may not be the most musically complex but is driven instead by an overarching sense of honesty. After paying way too much for an IPA poured by a bartender wearing the same tortoiseshell glasses as me and listening to a girl defensively rave about the Black Keys for about twenty minutes, I was relieved when the lights finally went dark, the air growing still. 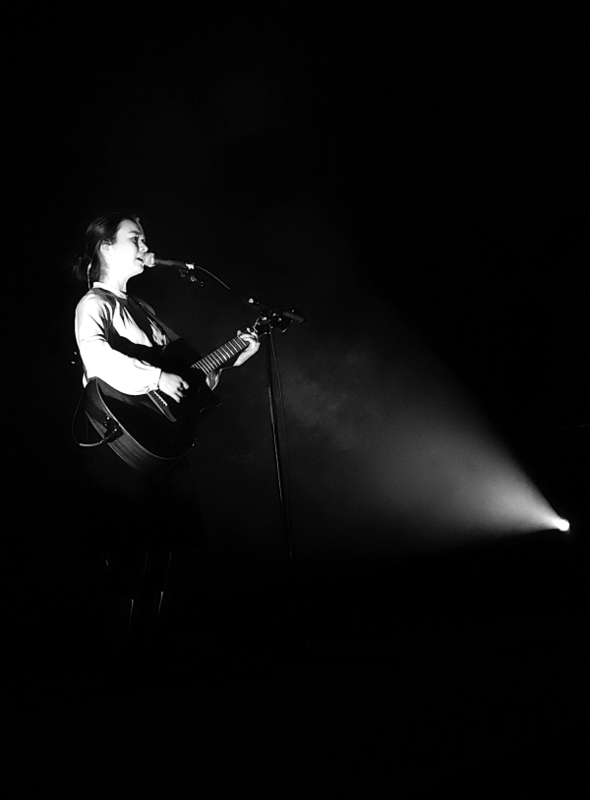 Mitski was a dark apparition, taking her place to the soundtrack of a 1930’s Italian ballad. The next hour was like stepping inside an avant-garde music video. Mitski is performance art. The way she moved and danced throughout the set ranged from robotic puppetry to ballet pointe work, to pacing and punching the air in chaotic tantrum. During “Two Slow Dancers” she made a noose of her mic, wrapping the cord around her neck and pulling it taut. Behind her, screens depicted morphing video imagery: television static, rose petals, a starry galaxy, a curving stretch of highway out of Twin Peaks. Perhaps owing to her background in the DIY scene, Mitski had a way of making a sold out show feel as intimate as a cramped South Philly basement. My face crumpled when she said in a small voice, “Thank you. It feels cozy here with y’all.” It’s hard not to feel overcome by the emotion in Mitski’s quavering soprano, moved to weepy sentiment you didn’t realize was buried inside of your chest. “First Love / Late Spring” will always be one of those songs for me, widening a cavern I try to keep sealed. While Be The Cowboy is undoubtedly her strongest work yet, those early songs maintain a kind of magic. This entry was posted on Saturday, October 20th, 2018	at 7:44 pm	and is filed under News	. Responses are currently closed, but you can trackback from your own site.